Very happy with my Kirkus Review for Love Spell!! In Slate Magazine (online) Kirkus is labeled as one of four book reviews that matter. I was nervous to get a Kirkus Review of Love Spell as I had only seen them on Amazon.com in association with rather famous books. How could one of my books get a decent review, like John Green’s The Fault in Our Stars did? Plus they are far from free. But I felt very confident that Love Spell was a book with a creative and quirky presentation and a solid message. So I went for it. A teenage boy has a crush on a fellow student in Kerick’s (The Red Sheet, 2014, etc.) first-person YA charmer. High schooler Chance César is no shrinking violet—not with his “hair dyed the flamboyant shade of a Cheez Doodle” and most certainly not while wearing “a scandalously snug-in-all-the-wrong (right)-places orange tuxedo and four-inch black pumps” while strutting down a fall-festival catwalk for the title of Miss Harvest Moon. He’s come to terms with being gay, but he’s still confused by some gender-related issues. Instead of owning up to having a feminine side, for example, he acknowledges to his best friend, Emily, that he has a “soft side.” He’s also told her about his romantic interest in Jasper Donahue, another student, whom he nicknames “Jazz.” The two boys eventually become friends, but Chance can’t figure out if Jazz is gay as well. 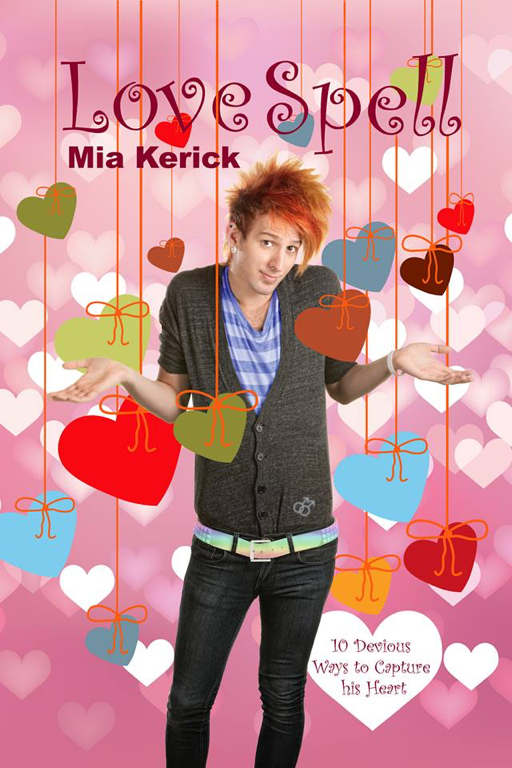 As he tries to get Jazz interested in him, he first relies on an online list (“Ten Scientifically Proven Ways to Make a Man Fall in Love With You”) and later follows a website’s instructions on how to cast a love spell on “The Target.” Kerick devotes most of the book to sassy fun and first-love desire, but her depiction of the loneliness caused by apathetic parents, the insecurity of extra pounds, the stress of college applications, the meanness of bullies, the importance of forgiveness, and especially the uneasiness of being “stuck in the gray area between girl and boy” make this novel thoroughly enjoyable. The book not only hits upon all manner of teenage angst, but also on the significance of true family values and on the joys of such simple pleasures as high–thread-count sheets, sharing homemade pizza, and playing card games instead of “head games” on a Friday night. The characters are memorable and the dialogue is consistently bright and believable, featuring authentic-sounding teenspeak. The author even defines Chance’s invented vocabulary words (such as “Randatorbs” and “Dooza-palooza”) in a back-of-the-book glossary for readers who can’t keep up. A comical, thought-provoking YA novel for those who believe in the magic of love without all the hocus-pocus. I am happy I decided to get this review. I will post it on Amazon and Goodreads and here! I’m not sure if I will do it again with another book, but it was validating for me with Love Spell. ← TOMORROW IS THE BIG DAY!!! COVER REVEAL FOR LOVE SPELL!!! WOOT!! !